I learned to knit when I was about six. Or maybe younger. Over the years I’ve made few of my own patterns and always meant to share them. Finally I’ve made a start. I’m not going to charge for patterns – that would feel mean. But if you want to send a small donation you can PayPal me here. 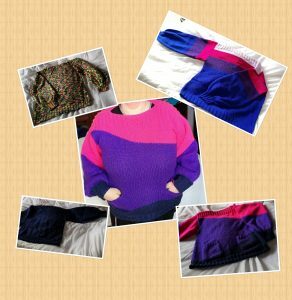 My first pattern I typed up is my beginner’s jumper. It’s really simple, and has a straight edged neck for simplicity.